Of the eight million tons of plastic trash that flow every year into the world’s oceans, the plastic drinking straw is surely the top contributor to all that load. Plastic items have a small life, are usually used once and then dumped into the garbage. Like other plastics materials, the straws never biodegrade and take numbers of years to break down. Plastic straws are one such single-use item and are ending up in our oceans. Have you ever seen the science experiment where a plastic straw penetrates a raw potato? It’s no wonder that plastic straws are threatening to wildlife. Due to their tiny size, straws are often substituted for food by animals and because of their circular shape, straws can create suffocation and death to the animal. In a video seen throughout the world, a sea turtle’s nostril bled as a plastic straw was removed. Marriott International is an American multinational diversified hospitality company that manages and franchises a broad portfolio of hotels and related lodging facilities. Marriott International is headquartered in Bethesda, Maryland, in the Washington, D.C. metropolitan area. It has more than 6,500 properties in 127 countries and territories around the world. 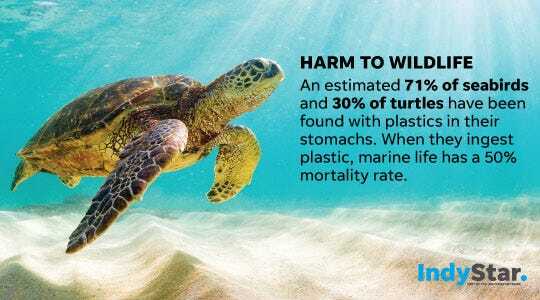 Marriott International has taken an initiative to save the marine life and intends to remove plastic straws and drink stirrers from all of its 6,500 hotels and resorts across the globe by next year. Marriott is the developed great company to discard plastic straws. Starbucks and American Airlines declared to drop plastic straws last week. Hilton Hotels and Hyatt Hotels Corp. will also stop using plastic straws by the end July 2018. Some Marriott hotels have already started dropping plastic straws. In February, more than 60 Marriott hotels in the United Kingdom banned them. Hotels in Costa Rica, Hawaii and Australia have performed comparable movements. “The JW Marriott Marco Island Beach Resort in Florida was using 65,000 straws each month before it eliminated them in March”, said Amanda Cox, the resort’s director of sales and marketing. At the beginning of this year, Marriott started displacing tiny bottles of shampoo and conditioner with in-shower dispensers at many of its hotels. The company says it will have the dispensers in 1,500 hotels by the end of this year, which will eliminate 35 million plastic toiletry bottles annually. These initiatives by big companies will ultimately help in saving marine lives which are currently affecting by plastic stuff. Soon, we will not be seeing any straws and plastic bottles in the hotel rooms. Always remember, the best time to work for the environment is today! Previous articleHow are delivery food apps like Uber Eat and Grubhub challenging the traditional hotel room service?